We provide a range of NHS treatments free of charge at Purely Orthodontics to eligible children and teenagers under 18 years old. Kindly note that we are only given funding to treat a fixed number of children each year so there may be a waiting list for treatment. Also, under NHS rules we are only able to provide NHS treatment to children with the most serious problems with their teeth. If your child is not eligible for NHS treatment we can stll achieve a perfect smile for them on a private treatment plan. To push teeth backwards if they stick out, or push individual teeth backwards etc. They are very helpful to make approximate useful movements especially in children who are not yet ready for fixed appliances. They are often followed by fixed braces which are used for more precise tooth movements. Braces which are used in growing children and they help correct protrusion of the upper front teeth ('treat teeth which stick out'). These can produce dramatic improvements if worn correctly and you will see a fantastic rapid change in your child's face especially if the teeth really stick out a lot. 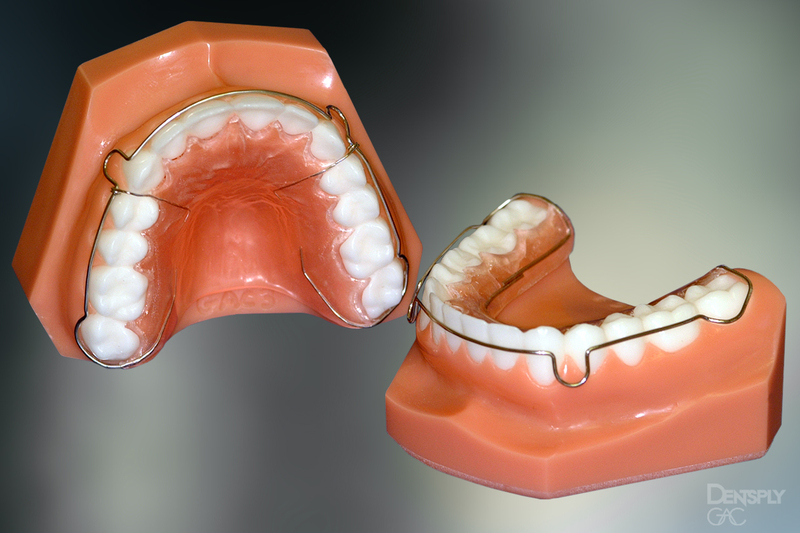 Functional appliances are simply removable braces which work by holding the lower jaw in a more forward position. The muscles of the jaws then help push the teeth and jaws in the right directions. The most commonly used functional appliances and consist of an upper and separate lower removable component. When the patient bites together, they need to bring the lower jaw forwards for the blocks to fit correctly. Video 603: Demonstrates who Twin Blocks work. A removable brace which come as one large piece of acrylic. This is fitted on the upper teeth and then the lower teeth need to be held forwards to engage into the patient's teeth imprints on the lower part of the brace. This brace is also comes with a high pull headgear and this must be worn at the same time. The head gear is simply a small black strap which fits on the head and then is attached to a face bow which is fixed to the brace. The headgear enables the patient to grow in the right direction and also prevents the patient's lower jaw from growing downwards. 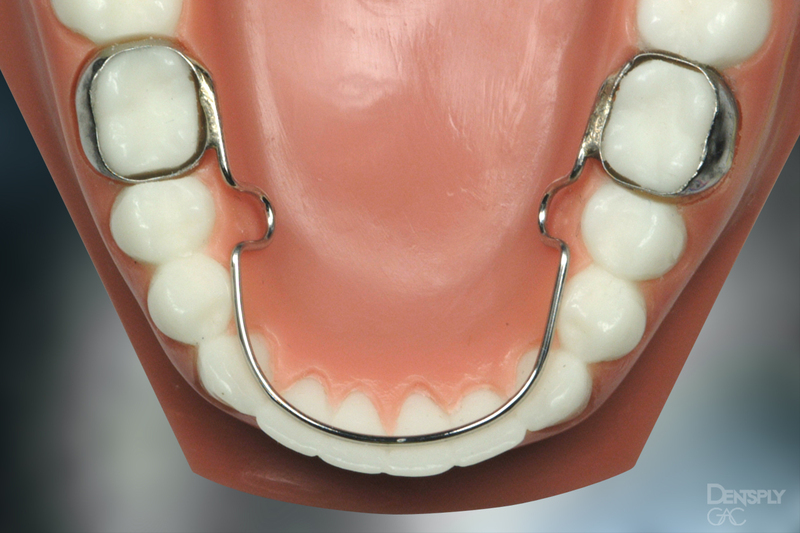 This brace is used in patients with longer faces and prevents any further lengthening of the face. A functional appliance which is a one piece appliance made of acrylic and is fitted on the upper teeth and there is an imprint of the patient's teeth for the lower teeth to fit into. When this brace is worn there is separation of the back teeth and this allows them to grow together and encourages lengthening of the face. This is therefore used in people with smaller faces and squarer jaws and who have deep bite tendencies. Headgears consist of a facebow which looks a little like cats whiskers and has an internal component which either slots into a removable brace or fixed brace components called bands (steel rings which go around molar teeth). There is also a small black strap which sits on the head and these two components are linked together and this produces a backward force to the teeth and jaws. 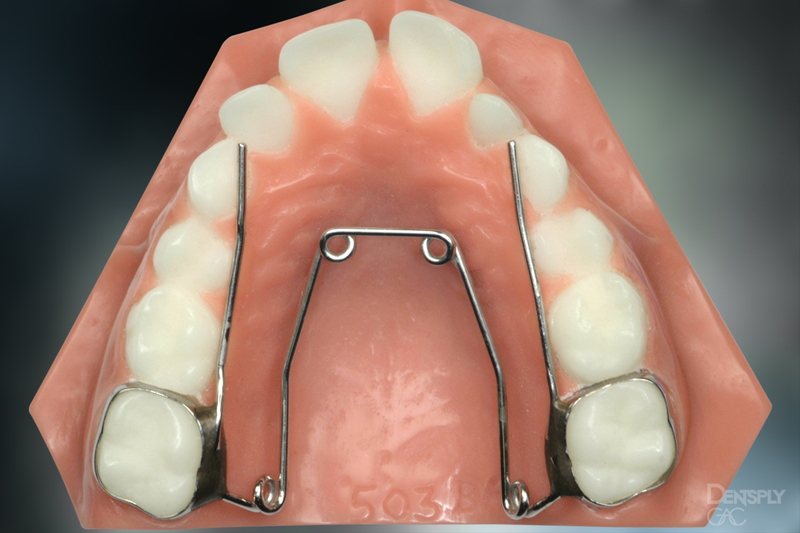 Headgears are still useful braces and are occasionally used in some cases to push back the upper molar teeth into a better bite. They can be used in mild cases to improve the bite and help avoid extractions. They are also used in severe cases to improve the bite and make more space before teeth are extracted. They also help the jaws grow in a more favourable manner as described above. Video 589: Demonstrates how a headgear improves the bite. Video 590: Demonstrates how a headgear improves the bite and creates more space for alignment or bite improvement. 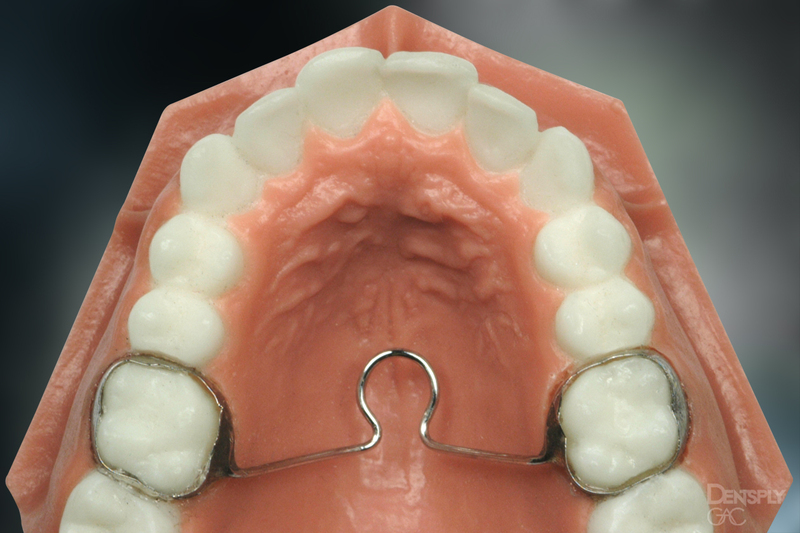 This is a fixed expansion appliance usually used in the upper arch. This consists of a thin metal framework which sits close to the palate and widens the upper premolar and molar teeth. 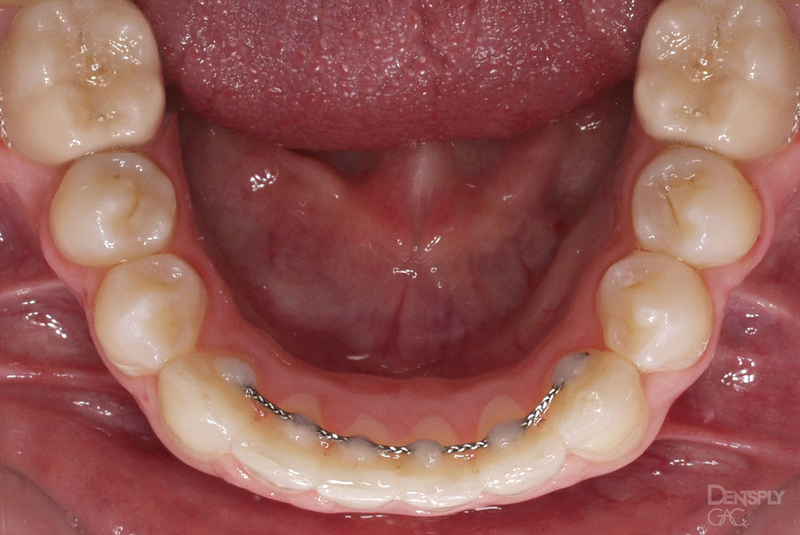 The orthodontist will activate this to produce a widening affect of the upper teeth. What a quadhelix looks like on a model of teeth. Video 334: Demonstrates how a quadhelix expands the upper arch. This is simply a metal bar which crosses the palate and follows it closely and links the upper first molars together. These are used to hold the back teeth where they are as front teeth are moved back and they are also used to hold expansion which has been achieved by an earlier expansion device. A TPA on a model of teeth. This is similar to the TPA above and this brace links the two lower molars together and prevents the forward movement of the lower molars. These are used to increase anchorage and sometimes are useful to hold space which may help avoid extractions. A lingual arch holding the lower back teeth back - when the baby teeth fall out there is extra space (“leeway space”) left behind which can be used to align the lower adult teeth. Demonstrates a lingual arch holding the lower back teeth back and when the baby teeth fall out there is extra space (“leeway space”) left behind which can be used to align the lower adult teeth. These are used in the upper arch and consist of a metal framework which is linked to upper first premolars and the upper first molar teeth by bands. There is a screw mechanism and this is turned on a daily basis by the parent. These are very effective in widening very narrow jaws and can sometimes help avoid extractions. There are reports that this can even help breathing difficulties as the nasal passages are also widened. Video 380: Demonstrates a rapid maxillary expander, widening the upper teeth and then a fixed brace is placed to align the teeth and avoid extracting any teeth. Video 328: Demonstrates a rapid maxillary expander widening the upper jaw, an x-ray view. Video 290: Demonstrates how the rapid maxillary expander screw is turned by the patient/parent. These are the most common type of braces we use. 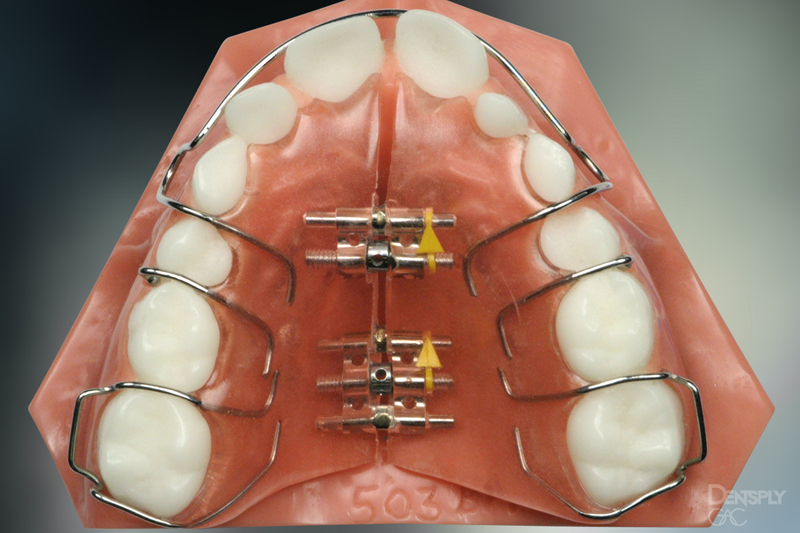 They consist of small metal pieces stuck onto each tooth (brackets) and then an archwire which moves the teeth. 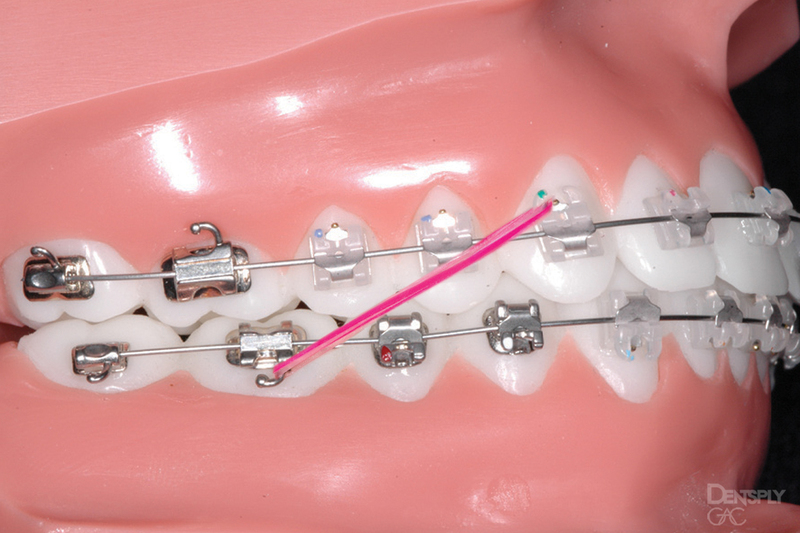 A thin flexible wire (Ni Ti wires) is first used to align the teeth gently. Once the teeth are aligned we progress into thicker wires called stainless steel wires and then we close any gaps in the thicker wires. Fixed braces are precise and can be used to move teeth in any direction and these braces give you that perfect smile at the end of the treatment. Extractions of teeth are sometimes necessary to produce more space for the alignment of crowded teeth or sometimes to enable the front teeth to be moved back in the mouth, so that they look better. At Purely Orthodontics we always will aim to produce a great smile without extracting teeth. However, this is not always possible. In moderate to severe crowded cases, extractions may be necessary. Which teeth or combination of teeth are extracted will depend on the degree of crowding and the patients bite. We always prefer to extract the minimum number of teeth possible to get the best result. We will carefully discuss the options with our patients before proceeding. Video 101 and Video 287 : Demonstrates extraction of four first premolar teeth, followed by alignment of teeth and space closure. Video 102: Demonstrates extraction of upper first premolar teeth and simultaneous overjet reduction and space closure. The impact on the profile and lips is also shown. Video 103: Demonstrates extraction of the lower first premolars and reduction of the reverse overjet. The impact on the profile and lips is also shown. Video 106: Demonstrates extraction of the four second premolars and the relief of crowding and space closure. Video 190: Demonstrates an occlusal view of the extraction of both upper first premolars and space closure and alignment. Video 436: Demonstrates extraction of one lower incisor and alignment of teeth. Video 460: Demonstrates extraction of one lower incisor and alignment of teeth and space closure. Wherever possible we will always try to treat patients by taking no teeth out. This is possible when there is no significant shortage of space. Also space can be gained by expanding the dental arches and also by interdental stripping of teeth (removal of enamel from between the teeth- to gain space). During the course of many orthodontic treatments we will give our patients a bag of small elastics called intermaxillary elastics and these are warn between the upper and lower jaws. 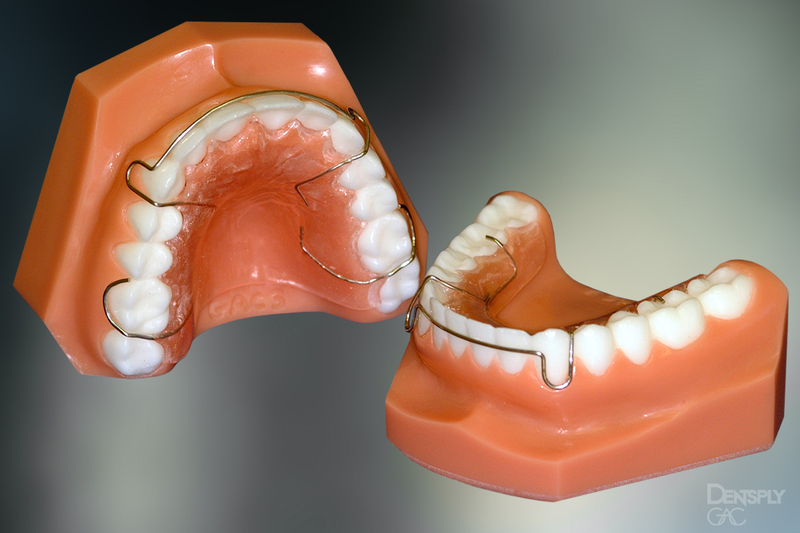 These elastics are used to move the teeth in order to: close spaces, improve bites, pull teeth forwards or backwards, bring teeth in the different arches together and correct midlines. The orthodontist will teach the patient how to wear these and the patient will practice before leaving the practice and show the orthodontist that they are able to wear these correctly for the right tooth movements to occur. Video 341 and Video 395: Demonstrates class 3 elastics working. These are used to pull the upper back teeth forwards and the lower front teeth back. Video 638: demonstrates box elastics helping correct an anterior open bite. Most patients do not like gappy teeth. The most common gap we see is a midline diastema (a gap between your upper central incisors). Gaps can be closed by fixed appliances and sometimes by aligners. Video 209: Demonstrates the space closure of a midline diastema. We do sometimes see that some patients have missing teeth (adult teeth which never develop). The teeth most often missing are the upper lateral incisors or the lower second premolars. We generally will always aim to close spaces where possible in these instances. Sometimes it is necessary to open the spaces with fixed braces and then your dentist will place a bridge or an implant to fill the space. The upper canine teeth sometimes get impacted or stuck in the wrong position and they have to be moved long distances to correct their positions. This will also involve a surgical exposure, where a surgeon will uncover the tooth (teeth) and the orthodontist will then move these teeth into the right position. Video 288: Demonstrates an ectopic canine being moved by fixed braces into the right position. The most commonly used retainers. They are thin clear plastic retainers which cover the teeth. As these are clear they are not too visible and well accepted by most patients. There life span is approximately 2-3 years. The first set is given free on the NHS and future ones must be bought to keep your teeth straight. We recommend that they are worn full time for a period of time and then every night for life, if you wish to keep your teeth straight permanently. They are easy to take out to clean and eat food. Hard plastic retainers with a wire in front of the front 6 teeth to keep then straight. 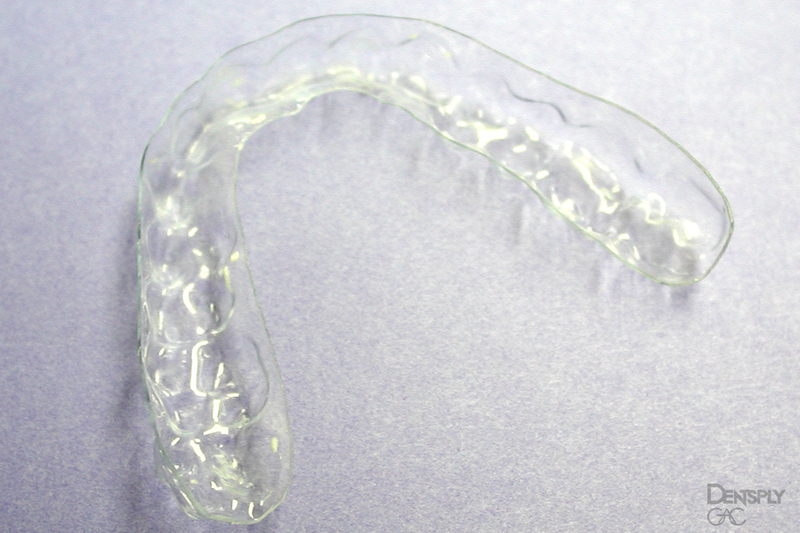 Studies have shown that these are effective in keeping the upper teeth straight, but Essix retainers are better at keeping the lower teeth straight. As Hawley retainers don't fully surround the teeth, they can sometimes let the teeth lengthen which may be undesirable. They are useful to allow the back teeth to settle as the teeth at the back can erupt a little to improve the bite after the fixed brace is removed. Similar to Hawleys, and are made of hard plastic with a wire on the outside of all the teeth. They are useful where you want the bite to continue to improve after the fixed braces are removed, as well as keeping the front teeth straight. These are thin wires stuck behind the upper or lower anterior teeth. They are usually held in place by a small amount of white dental glue. The advantages are that they are fixed and not removed. The disadvantage is that they are harder to clean. Also these do sometimes break and need replacing or maintaining. We usually recommend that you should also wear an Essix retainer as a back-up to something going wrong with your fixed retainer.